Build your honeymoon trousseau with these beautiful bridal favorites. hic wardrobes don't have to stop on the wedding day! Honeymoons are a beautiful way to tie in bridal beauty with relaxed vacation style. If you're traveling to a coastal destination, then our roundup of favorite must-haves is definitely one to pin and bookmark. From trendy rompers to handmade leather goodies, there's a little something for anyone looking for casual chic with a touch of practicality. Fashion trends always come back, and let's be real. The fanny pack (or more modernly known as the waist or hip bag) is a pretty amazing and practical thing. As someone who's always carrying multiple bags while traveling, this handy accessory allows me to access my tickets, IDs, or phone readily without having to switch bags to different positions. If I have to leave my seat on the train or plane, my important documents come with me. So, friends, it's totally time to bring this once neon plastic relic into the 2010's with chic, stylish leather, and Barcelona artisan Nubuckcuir is leading the way. No matter if you're going on a cruise or staying at a coastal resort, sunglasses are a must to protect those newlywed eyes! There are so many great ones out there, but two of my favorites are these masculine Revo Freeman shades and these classic Velvet beauties. They complement each other just perfectly and make for some fab photos together! J.R.R. Tolkien really said it best, "Not all who wander are lost." 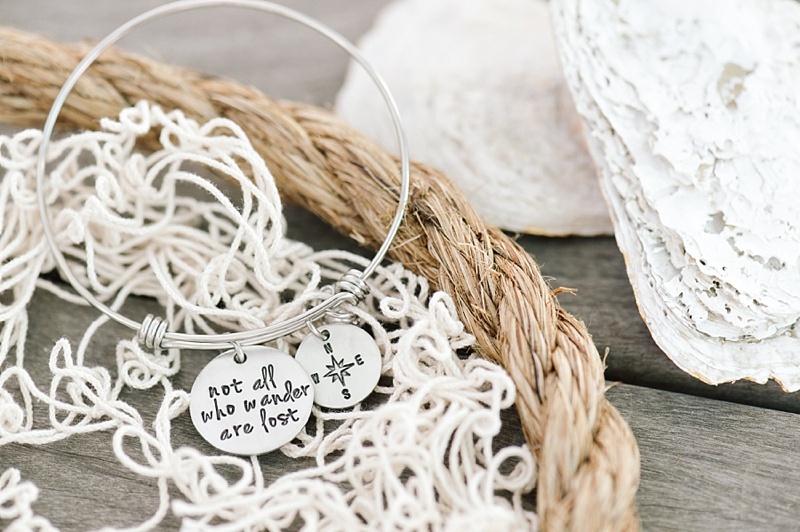 For those who seek the world and adjustable bangles that fit all wrists, I love this casual visual reminder of knowing where your North is and the freedom to be guided by your own personal compass. If you're an Alex and Ani fan like we are, this fits right in with your collection, too! So stack 'em up! It's bridal meets honeymoon chic with this off-the-shoulder romper from BHLDN. It's a favorite of mine for its flowy, yet soft fabric and its comfy fit. You can wear as a swimsuit coverup or as an outfit by itself, so if you're honeymooning for more than a weekend, then you've got a few different multi-use options with this number in your trousseau! There's no need to settle for what's in the big box stores when it comes to organization and travel comfort! 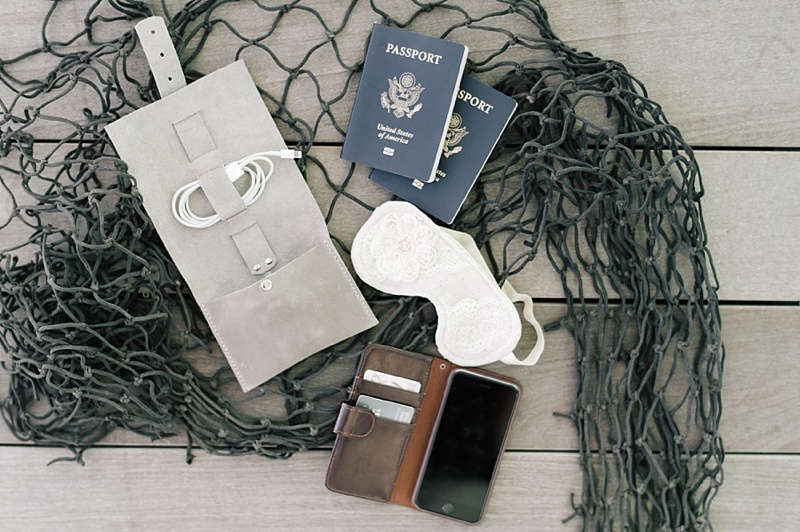 From handmade leather cord organizers to wallet phone cases, keep all your important packing items in chic style. And when you take a nap on the plane, make sure to block out that light with a pretty ivory-colored sleep eye mask so you get some good shut eye before reaching your destination and celebrate your newlywed status at the same time! With the rise of artisan goods and handcrafted accessories, these gorgeous leather sandals fit right in. Silver and white straps make this perfect for a sunshine-loving bride looking for a stylish neutral to match with her entire wardrobe. They even come in a nice shoe bag ready to put right in your suitcase! 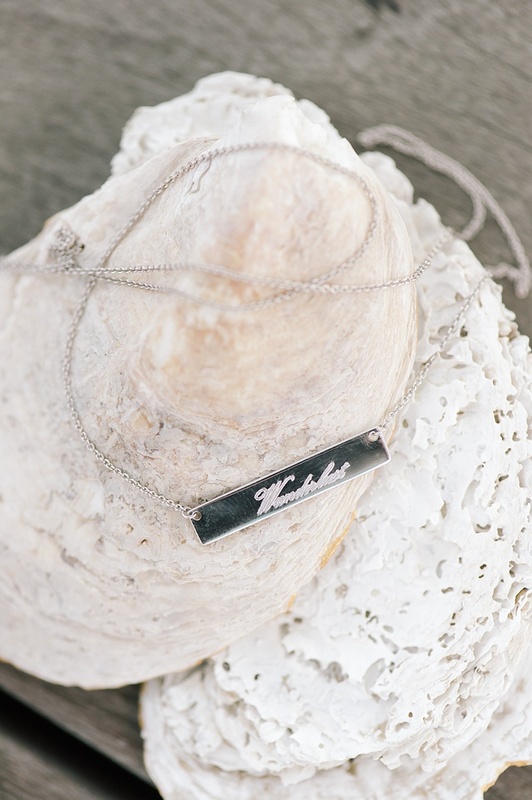 Trendy and classic, this silver bar necklace only needs one word to get you in the travel spirit! 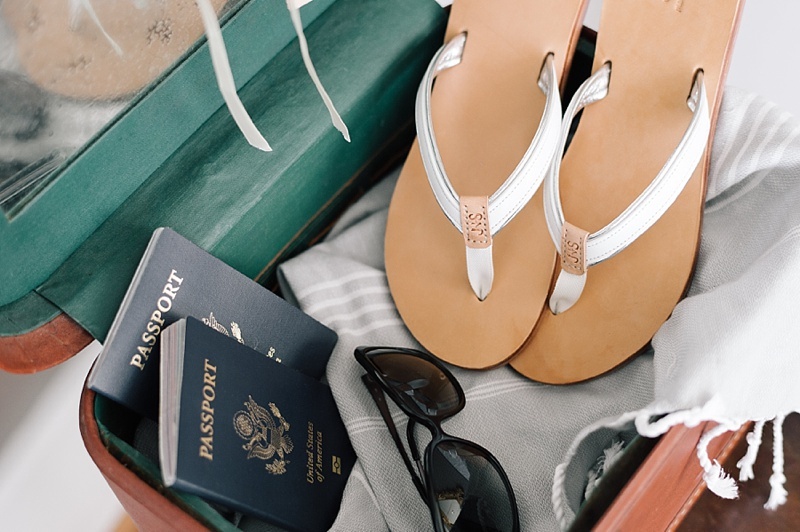 Accessories that can go with many different outfits are the way to go since keeping it simple helps keep packing to the essentials: swimsuits, loungewear, and those special honeymoon must-haves. Channel your wanderlust and bask in the gloriousness that is your first real vacation as newlyweds. There's no greater adventure than that with your beloved!